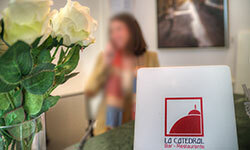 The team at Hotel La Catedral offer you their knowledge and experience in the sector and are excited to host all kinds of events such as christenings, first, communions, civil weddings, wedding receptions, birthday parties, business lunches or dinners, formal dinners, press conferences, cocktail receptions, concerts, tastings (wine, coffee, cheese, oil)...and any other ideas that you may have in mind. We are ready for any challenge that you set us with our aim being always to meet your expectations in a special way, making your experience something unique and personal. We have set menus and infinite possibilities available, depending on your needs. Events can be held in any of our rooms, depending on the type of event. We are open to your ideas.